My best friend was moving back to Toronto! Yes! And leaving LA for good. Yeah–ohgodwait. Goodbye free place to stay in LA?? The time between that realization and the plane ticket I booked was short. The visit was long. I wrote at length before about quaint Silver Lake shops, why Palm Springs is worth the visit, and about the Geffin, the observatory and other must-visit spots, including the markets and food. This is just a quick update to that guide. 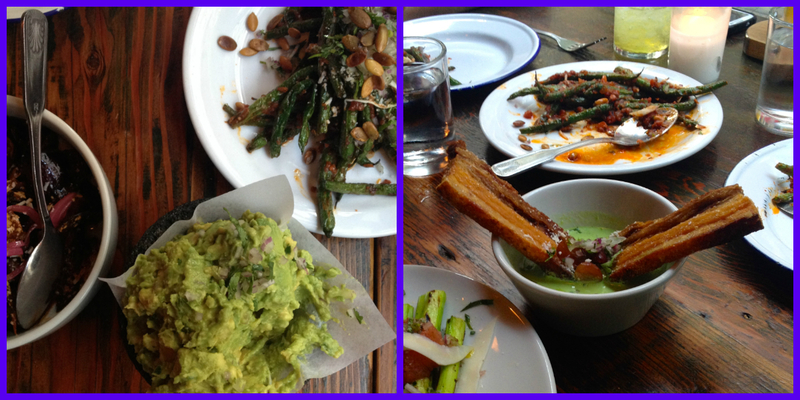 These are the top new and new-to-me spots from my last (but not last ever!!) trip to LA. Pictured above is our table at Bar Ama and one of the standout dishes from the entire trip. I’ve had pork belly plenty of times and it’s almost always good, but this preparation and presentation stood out. I would have thought a fried slab would be too much–both gilding the lily and just too rich. But it was soft and yielding, not greasy if you can believe it, and begging to be picked up and bitten and then dipped again into the salsa verde it yielded to a gentle bite. The only reason to use a fork was to get at the sweet grapes to balance that luxurious, salty bite. But I went in with a spoon because that sauce! There were pretty cocktails, beer flights, all kinds of other delicious plates were ordered, but this alone is worth the visit. 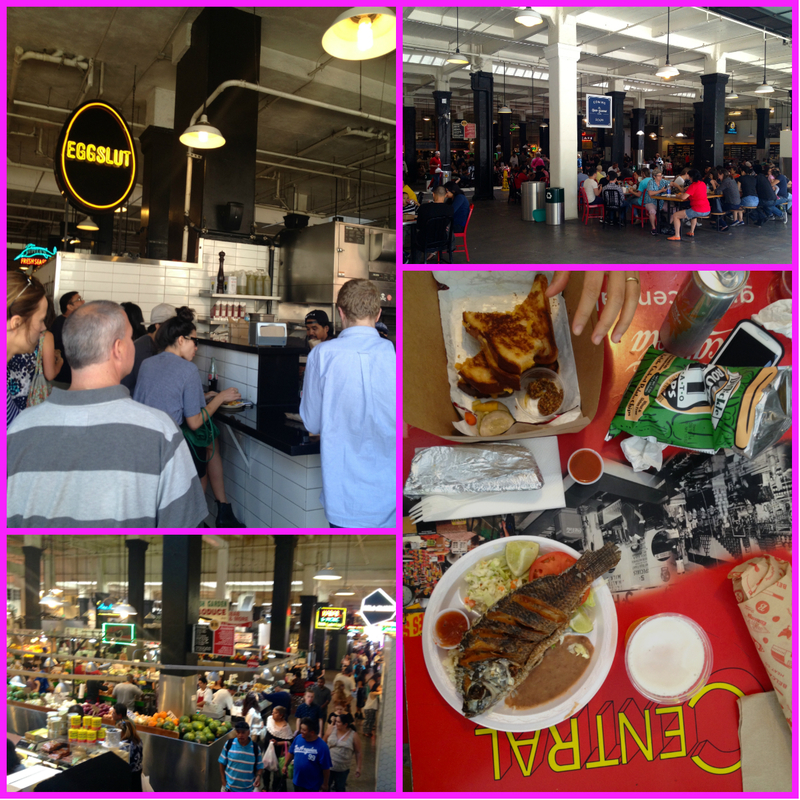 I ran around Grand Central Market in a mild panic. I was expecting to be impressed but I wasn’t expecting that. I came upon it from the side that has the coffee bar right on the street (the whole thing is open on two opposite sides so the place has the feel of an open-air market, with large seating areas, some under the sun) but I swear people were mostly drinking frosty glasses of beer. The panic set in when I realized how many choices are housed in this place. Yes, there are cheese mongers and butchers and other merchants but then they each have food counters offering up killer grilled cheese sammies and fresh to order (freshly sliced) Philly cheesesteaks respectively. There was Hawaiian BBQ and carnitas and Eggslut (still haven’t had!) and brick oven pizza and how the hell can one choose? It’s fine if you can go every weekend. I would. To have to narrow it down to one meal, and a modest one since we had dinner reservations in less than 3 hours, seemed like asking a little much of me. I settled on food from the fish stand. You know, where they serve you a whole, freshly fried fish, with a heady, refried bean mash and a bracing salsa. I had a beer. I could not believe I was 50/50 on checking this place out. You might not think of a bakery as a destination spot while visiting a city, and I suppose I agree. I’m still glad Steph politely mentioned this place more than one. The wall of beautiful loaves is one thing, but the tall quiches, hard-boiled egg rolls and other savoury, doughy snacks (lunches for some, I guess) are what made Bread Lounge memorable for me. I mean that is a breakfast pizza, am I right? All it needed was to be doused with vinegary hot sauce and they had that at the ready. The resources can be overwhelming when you try to plan an itinerary. I prefer sites with edited recommendations, not comprehensive ones–you just have to be sure to trust the source. The New Potato asks for reccos from locals–many famous although that far from guarantees that the recommendation will be any good. But when I read through Busy Philipps’ picks, I liked them all. All. I thought, this is a person I could have a night out with. We could be dining companions. I said so to my friends and I told them that’s why I’d picked Petty Cash Taqueria, on her recco. We had ridiculously good drinks there and the best nachos I’ve ever had. Quite frankly, roasted cauliflower nachos do not sound that good. Pickled fresno chilies, crazy good crema and probably a magic spell in the kitchen made these the only thing I really remember clearly. There were very good pulled pork tacos I think. BTW on the last night of the trip, I sat under the trees and stars on the Gjelina patio at dusk, across the fire pit from Busy Philipps. See? We are on the same page and I guess I did have dinner with her. Next time hopefully she will know I’m there. Look, I’m happy to wait for a table but I usually do it while at the bar. At Chengdu Taste, you, a group of seven 20-something boys and even grannies will wait outside for a table for up to 2 hours on a weeknight. The place commands this kind of patience and elicits dreamy posts from Ruth Reichl. Upon returning home I immediately hacked a recipe to mimic the cumin and Sichuan peppercorn “toothpick lamb” but I doubt I will ever, ever be able to make fried rice that good because if I knew how I would have done it by now and I would eat it at least twice a week. None of us had ever had rice so perfectly fried and fluffy and delicious and so freaking fantastic. Many dishes are an exercise in combining fresh chilies with dried bird chilies with chill oil before dusting it all in Sichuan pepper until you can’t feel your tongue and don’t want to because holy heat…! Which is just how it should be.